Hello all, my name is Terri Sproul and I have the honor of being the Team leader for the Viva Las Vegastamps! Design Team. I have been working with a wonderful group of bloggers. Today I bring you a Mixed Media project using lots of exciting products. Stamps: A lot from Plate #1273 - just purchase the whole plate - can't beat the price. 1) Roll out paperclay to about 1/4" thick. Start pressing Stamps into clay. Cut out image using square and rectangle cutter. Cut about 30'sh of these. Set aside to dry. 2) Roll out more paperclay and add some gears, keys, clock faces into the clay and cut around them. Set aside to dry. HINT: you can add more detail to the clay while it still wet, like the lines I added around some of the edges. 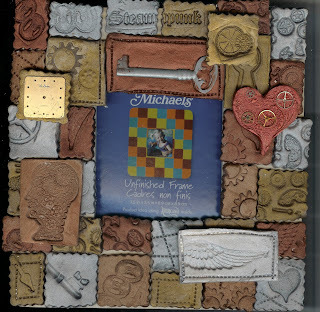 I also stamped Steampunk Heart onto the clay and cut around the image with a butter knife. mixed well and started to paint each of my pieces. 4) after all the piece are painted, I adhered my paperclay pieces down to the wood frame with Elmer's Glue-All. I hope you like my project, I so do... smiles, please check out our Design Team call for the next term. We would love to have you as part of our team. I still need to play a photo in the center - I think I am waiting for Halloween this year - I'm going Steampunk! Terri Sproul - I hope you follow my blog. Viva Las Vegastamps! is looking for a few awesome PaperCraft Artists who can showcase the Viva Las Vegastamps! products! 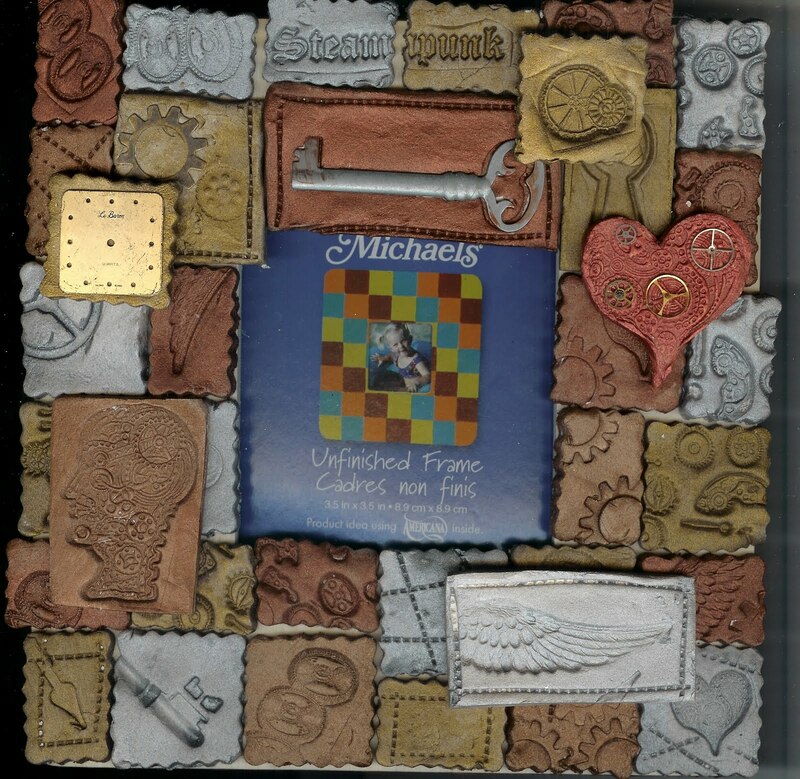 If you LOVE PaperCrafts, are able to utilize the unique line of stamps from Viva Las Vegastamps! on scrapbook layouts, cards & projects then show us what you love to do!! 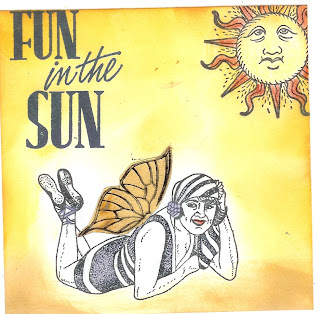 We are looking for talented artists who inspire others to create using Viva Las Vegastamps! stamps and supplies. What’s expected of a Viva Las Vegastamps! Design Team Member? *The Viva Las Vegastamps! Design Team is for six months from Oct 1, 2011 – March 31, 2012. * Create a minimum of two layouts/projects per month posting on both your Blog and The Viva Las Vegastamps! Blog – dates will be given when team in picked... projects must be hand stamped and not digitally created. Only stamps from Viva Las Vegastamps! can be used in your DT projects. * Participation and promotion of Viva Las Vegastamps! on Facebook is a MUST... promotion on other Online Rubber Stamping Groups is an asset... promoting Viva Las Vegastamps! in your signature, posting VLVS! artwork to Online Galleries, etc. * Submit work for publication. * Promote Viva Las Vegastamps! by posting the above layouts/projects on other Online Galleries and Blogs with working links to the Online VLVS! Store and Blog. * Your bio and picture featured on our Blog. Joining our Facebook Page and Blog is a MUST and is very important to the success of our team! All entries MUST utilize a Stamping Technique... if you can use our stamps, even better!! Work submitted must be recent and can't be previously published or displayed on blogs or online galleries. * Why would you like to be on our team? * Are you frugal, organized, have marketing ideas etc.. if so share with us what you can bring to our team. * Link to your active Blog? * Give an example of a class or technique you would like to share with others. If it is one you have done previously, please link to it. * Details of any other manufacturers or store/kit DT’s you are on Do you have a scrapbook resume, or a link to a gallery? If so, please share with us. Final decisions will be made on Sept 15th’sh and the Viva Las Vegastamps! Design Team will be announced shortly there after!! At my poor attempt at a title let alone a rhyme...here is my post for this week! I like to call it "Halloween & Wine: But Not At The Same Time"
I ended up not knowing what to do for this week's post at the beginning and ended up with two completely different projects in the end. For my first project above I took the back of a cork board coaster and added one of the VLVS to it. I used various inks, craft markers, blending tools, glitter pens, etc for coloring. I had some 'gel' embellishments that fit in the corners nicely and then added a border to each side as it looked a tad bare without it. For my next trick...I mean project...I just did an ATC. I guess I could say this is my very first Halloween Project of the year! You can find THIS STAMP HERE. I used paper from my stash, gel pens, blending pens, and other craft markers for my coloring. I used the same border as in the first project but I think it looks very different. I also used black ink around the edges of the white paper where I stamped the image. Swing by and visit my blog HERE and don't forget to stop by the shop! Thanks for reading! Today I wanted to share with you how easy it can be to snip off a few small parts of a stamp and make it fit a new use!! $8.75 - 3" x 1.75"
and I snipped off his umbrella!! other products used: Momento Black, wooden spool, twine, Basic Grey's Lime Rickey, black pen, Distress ink and stain, water, manilla tag, old book, VLVS Miracle Tape. I've also entered this tag into the Spotted Canary Summer competition - keep your eyes peeled for the voting to open! How to layer your stamps! 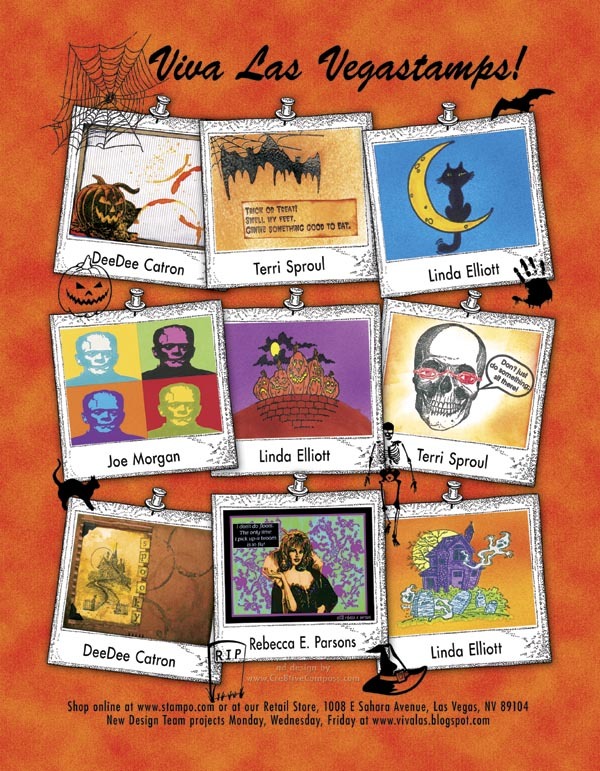 Terri Sproul here to show you another one of my video - You can see more on the Viva Las Vegastamps! website or check out my Youtube Channel. This Video show you how to layer your stamps.. This is the basic of layers. Hope this help you think of your stamps in a different ways.. Enjoy. Now was the easy or what????? Now off to the website to purchase your Miracle Tape and more stamps! 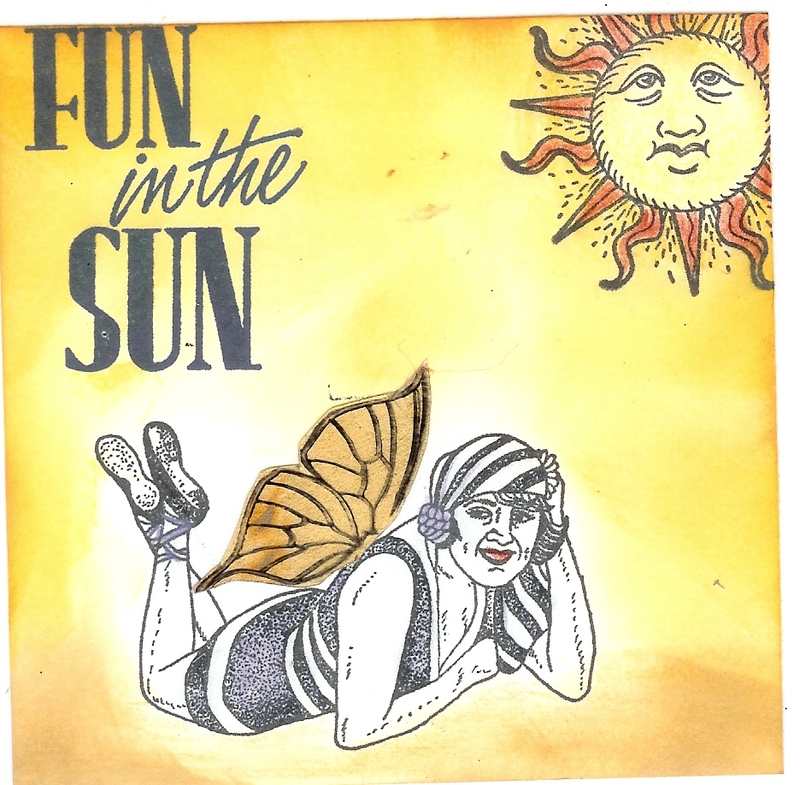 Have fun!!!!! Thanks for stopping by.. remember to stop by my blog too please! Sometimes, two things collide and the result is a very interesting card. I eagerly opened the “pound of rubber” from Viva Las Vegastamps! as soon as the package arrived. Would it have cool stamps? How many would be ones that I would have picked out myself? Would there be any surprises that would really inspire me? Challenge me? The result was a bit of all of that and more. I was immediately surprised how many stamps are in a pound of rubber! It’s a great deal, even if you only end up loving a few of them. Remember, you can always give the ones you don’t like to friends or sell them at a scrapbook garage sale! You might even end up with some you might not have thought to buy, but once you see them they bring a smile to your face. That’s what happened with “Four Ladies Wading” (#14906). It immediately reminded me of the times I went swimming with my female friends in Georgia. I thought to myself “I could use this to make a card for my friends” and the wheels starting turning. I had some sand and shells from our cruise to Mexico and knew I could incorporate those items along with the stamp. I saw the sentiment, “Of course, I can’t go swimming” (#1436) when I was shopping at the Viva Las Vegastamps! store when I was in Vegas in June. I thought it was really funny, in a dark sort of way, and had to buy it. After all, as you’ve seen, many of my cards have a sort of twisted humor. The combination made a great card! I stamped “Four Ladies Wading” on white cardstock and colored them with Copic markers. I cut out the shape using the Labels Eight Spellbinders Die. To create the blue sky, I used Broken China Distress Ink from Ranger. I applied Clear 3D Crystal Lacquer from Sakura Hobby Craft to the waves to make them look wet. The last step was to adhere some sand and shells using Scotch Quick Drying Tacky Glue. I stamped the sentiment on white cardstock, drew a speech bubble around it and cut it out. Challenge yourself. Consider getting a pound of rubber from Viva Las Vegastamps! and force yourself to use some stamps you might not have picked out yourself. Who knows, the results could be amazing! Don't forget to check out our blog on the Create & Craft website for some really great project ideas! I have been having so much fun with this face stamp called Facial Feature - SKU 5908. You can find the stamp at Viva Las Vegastamps! I made an Inspirational quote book, and used the face on one of my pages. I used Miracle Tape to adhere the paper to the chipboard. If you haven't tried Miracle Tape, why not give it a go? You can also find it at Viva Las Vegastamps! And here is another page I did using Marilyn. I will post a link to the stamp I used as soon as the site is back up again. Sorry about that. Thank you so much for stopping by today, and I promise not to use this face stamp in my next post!! Hello all, Terri Sproul here to show you how to make wings, all kinds of wings, fairy wings, butterfly wings and angel wings... Hope you enjoy... We have more videos on our website too. I love wings! I came up with this amazing video on how to make fairy wings or any kind of wings you have a stamp for... Viva Las Vegastamps! has a large variety of wings. Hope you enjoy! This Project - all stamps are from Viva Las Vegastamps! Stamps: Wing stamps from Viva Las Vegastamps! Miracle Sheets from Viva Las Vegastamps! 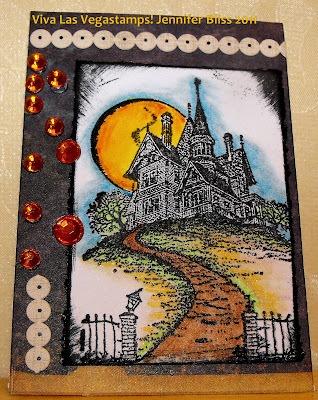 Staz-on Ink pad - I used Black - available from Viva Las Vegastamps! 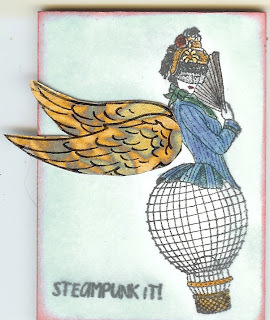 This one is an ATC using Stamps from the Viva Las Vegastamps Steampunk Collection. Terri Sproul - stop by my blog and visit me too..
As soon as I saw this stamp I just knew I had to have it! I cut the "kiss me" out with the Cricut. I'm working on a fun Christmas card with this stamp too!! You should head over to Viva Las Vegastamps and get one too!! I'd love to see what you would make with it!! I'm the first to admit that my tag making needs a little work but I couldn't resist at least TRYING with this little Butterfly Stamp from VLVS and stampo.com. After inking it up and stamping I colored it with different colors if Stickles. I added a little more bling in the form of gems. I had some Butterfly "create" header stickers that I cut and repositioned and also had a butterfly border that I came across lately. I used some of my designer paper left from my stash, too, as I am trying to use more and more of that up. I had a little bit of fiber ribbon I used here as well. Another thing I LOVE about VLVS Stamps is the variety. I'm not really a butterfly collector, per say, but there are things that I do collect such as unicorns. But I will tell you what...VLVS has just about anything you want or need if you collect something. Don't forget to swing by my blog as well as stampo.com today! Thanks for visiting! Stamping on old book pages! Hey all!! DeeDee here again!! Today I'm sharing a tag with you.. and I know you've seen this stamp before, but I wanted to show a really great detailed stamp on a patterned background!! Balloon image on (3" x 3.25" - $11.75) --- I also used the Miracle Tape SHEETS to adhere an old newspaper clipping to my tag, which provided another GREAT patterned paper base! I added some distress ink, a bird stamp, a few banners and popped up my balloon with a few pop dots!! You don't always have to use a white piece of paper and color in your stamps.. there are lots of ways to give them some nice texture! Our Design Team is busily working on Christmas/Holiday cards for the next issue of RSM but the fall issue is at the printer's and this is our full-page, inside cover ad for that issue. Rebecca Parsons did a wonderful job pulling it together and we'll use this format for future ads as well as Viva Las Vegastamps! has the inside cover for the next year! 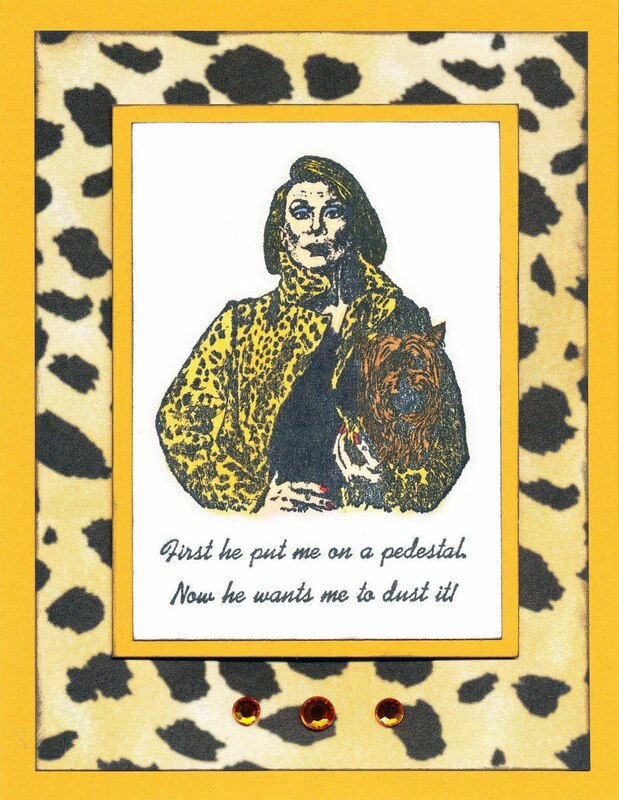 So who can relate to this card? While browsing in the Viva Las Vegastamps! store a few weeks ago, I noticed the unusually large selection of stamps of different women with unique facial expressions. Then I came across this sentiment (see card) and knew I could put it to use. I stamped using Memento ink and then colored with Copic markers. Then I inked my edges and assembled as pictured with some coordinating patterned paper. I raised the matted picture piece with foam tape and finished with three orange rhinestones. This looks like someone who would own a lot of jewelry so I thought the rhinestones were a good match! That’s my project for this week. 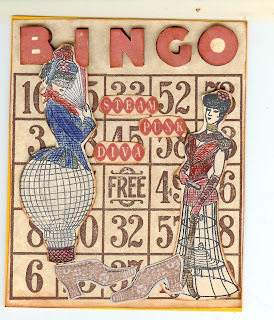 Be sure to stop by my blog to say hello and see all of my Viva Las Vegastamps! projects in one place. Thanks for looking, would love to hear your comments. "I'll fly away" - mixed media artwork on canvas 10" x 10"
I had so much fun creating this mixed media art. I used two Viva La Vegastamps! in the above design. (See below) I also used several pieces of ephemera from my collection. I have been collecting vintage paper items for years. 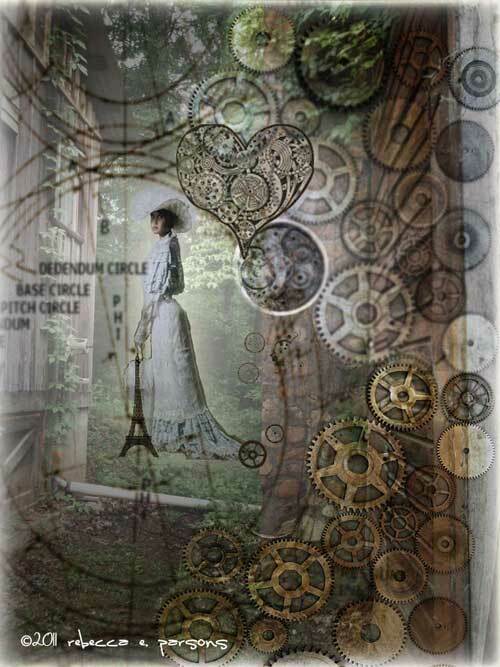 I also love using rusty and found objects in my art, so steampunk is a natural progression for me. 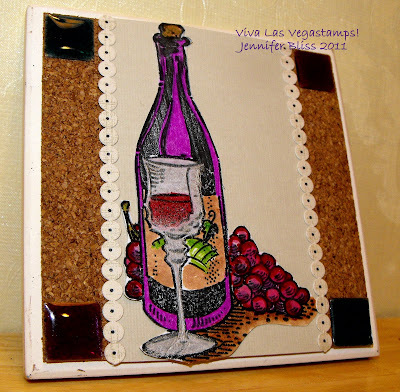 Hello, my name is Terri Sproul and I am so happy to talk to you about Rubber Plates that Viva Las Vegastamps! has to purchase. Here is a Card I just made using stamps I got from one of the plates I purchased. What is a plate you may ask? Well this is a great bargain for us stampers. It's a wonderful selection of unmounted rubber images measuring approximately 7" x 9". The best part is the cost - Viva Las Vegastamps! makes and sells these plates for just $21.95 (+ tax and shipping) and there are a lot of images on each plate. I purchased plate #1336 - which has over 25 stamp images on it... do the math! WOW! I also purchased the Bingo Card stamps - this is a large background stamp measuring 4 3/4" x 5 3/4"... fell in love the minute I saw it. I know you understand that! steampunk shoes - every girls need these..
1) Stamp all images onto cream cardstock. 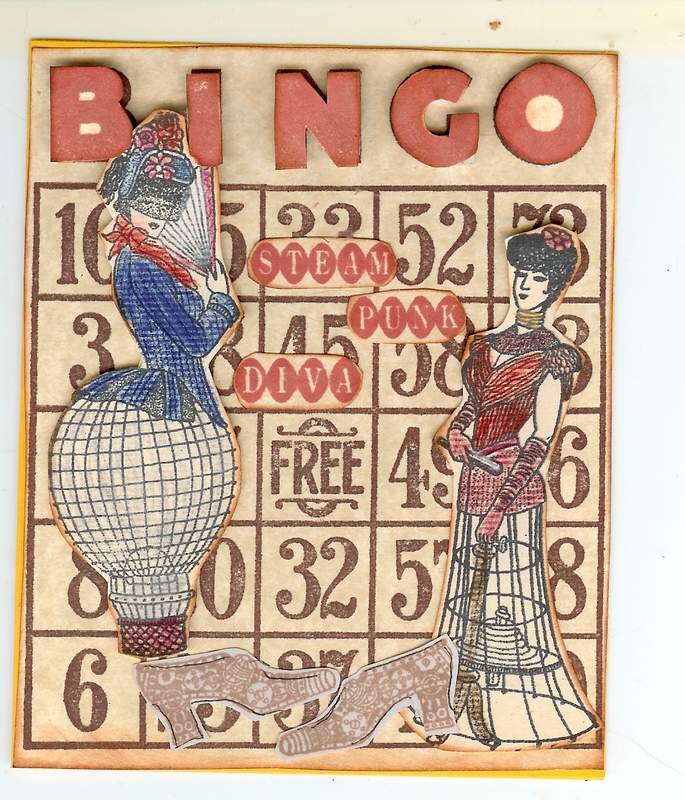 I stamped the Bingo Card in both "Artprint Brown" ink and then in "ruby"... cut the ruby letters out and pop-dots to other Bingo card. Cut card out and aged edges with Brown Chalk ink. 2) Stamp both Ladies in India Ink Black onto cream cardstock and cut images out... colored in images with colored pencils (I personally like color pencils... the color is NOT so sharp). Added brown Chalk ink to edges to age image..
3) Stamp Steampunk Shoes with ArtPrint Brown inside and outline with fine black marker... cut out images. 4) Stamped "Steam", "Punk" and "Diva" onto cream cardstock with Ruby Ink - cut out images. 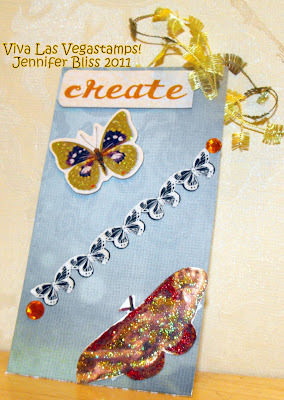 5) Adhere Bingo card to Card base with my Miracle Tape.. add all the other images and adhere with my Miracle Tape. Made a pop dot with my Miracle Tape and pop up "Fan Lady with Balloon". This was a fun card to make. That Plate has so many different fun image to play with I just could not help myself. Hope you like. Remember to head over to the store and purchase that plate or at least a stamp or two. Kim here, and it's my turn to post! I just love this lady's face and can't get enough of stamping her! She is called Facial Features - SKU #5908. You can find her HERE. I stamped her on acetate with Stazon Black ink, then used Nestabilites to make a frame. I then punched a pile of flowers and put them around the frame, and added some bling to the centers of the flowers. Adhesive used on this card is Miracle Tape, incredible stuff! If you haven't tried it, you really should. You will not be disappointed! Viva Las Vegastamps has the biggest and best selection of stamps, and you can get them unmounted if you wish! What a space saver! We have a winner for the Blog Candy from our first Viva Las Vegastamps! Blog Hop with our Design team. All of the projects that our team did were just amazing... Hope you enjoyed it and come back on Mondays, Wednesdays and Fridays to see more of our team work. what you want to learn. I hope you all had a safe Holiday weekend! Did you get any stamping done? 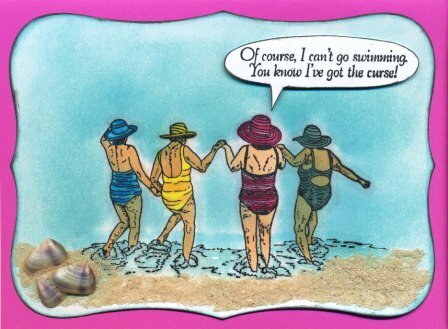 I think this is a perfect holiday card for stampers! !